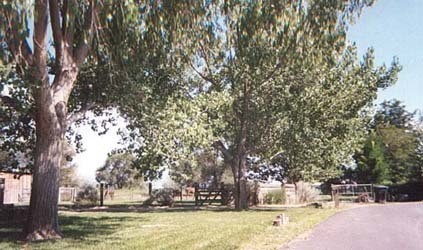 The Otero family of Los Lunas repossessed the land, and in 1934 sold 2,420 acres to the New Mexico Rural Rehabilitation Corporation which was taken over by the Federal Resettlement Administration which became the Bosque Farms Project. This project divided the Bosque Farms tract into 42 parcels of 40 to 80 acres in size. Forty-two families were chosen by a lottery in May 1935, and paid $140 per acre on forty-year mortgages. These 42 modern pioneer families stayed to build our present Bosque Farms community. Bosque Farms has the choice rural living of New Mexico for horse lovers and community functions involving horseback riding, rodeo area, fairgrounds and horse shows. This is a community of 4,500 people where traditional values are today's values; where the individual is important; where you can drive down a modern main street and see horse back riders along the river. Despite the convenient 15 minute proximity to Albuquerque, the largest urban community in the State of New Mexico, Bosque Farms will not be swept up in urban sprawl.